Yesterday was my first day of the year full of the manic joy that is canning season. My garden unexpectedly delivered a colander full of pickling cucumbers. Some of the cucumbers had been doing a good job of hiding and were pretty huge. My job was clear. Pickle them while they’re fresh! The large ones were sliced thin for hamburger dill slices in order to make them fit into jars. I was rewarded for my work with two quarts and four pints of Green Garlic Dill Pickles. I know a lot of folks out there are intimidated by canning. I understand it… The food police have scared us with their constant semi-subliminal message that the only food safe to eat comes hermetically sealed in jars and boxes barely touched by human hands. Look at all the things that can go wrong, botchulism, salmonella, mold, etc… The truth is, though, that canning is an incredibly safe and economical way to provide outstanding food for your table. I’ve put together a little primer on making garlic dill pickles; by far the easiest thing outside of jam to can. There are really only three things you need to do to ensure successful pickles. For starters, you’ll need intact glass canning jars that come with new two part lids. The ones with hinge lids are pretty, but they don’t seal as consistently… For now, leave those for short term storage. How many will you need? That depends on how many pickling cucumbers you have. One peck of pickling cucumbers yields approximately 12 quart jars of pickles. I’ll give the recipe in a “per quart” format. That will make it easy for you to scale up to however many cukes you have available. To store the pickles, put them in a single layer on a shelf in a cool, dry place. A closed cupboard or basement shelf is perfect. Homemade pickles are at their delicious best when served super cold. Now I’m going to tell you another thing that seems contrary to common sense. Remove the rings from the jars when you set them on your shelves to store them. Remember I told you the rings are there just to hold the lid in place? Left on the jar they can actually prevent you from knowing a problem exists both before and after storage. After processing, the ring has performed the duty it was meant to do. It held the lid in place long enough to form a seal. Removing the ring allows you to inspect the seal before storage (and refrigerate any jars with questionable seals.) It can give you an obvious sign that things inside the jar have gone awry. In ten years of canning, I’ve only had one item go bad. It was a jar of blueberry jam. I had laughed at my Grandma’s advice to leave the ring off, but had listened to her and done it anyway. I went down to my basement to retrieve a jar of something-or-other and saw that the lid had blown off of a jar of blueberry jam. That is an indicator of a bad thing. Now, there was hairy mold and it was slightly off-smelling, too, but I might not have checked it over so carefully had that lid not blown off. Save yourself some trouble and do what my Grandma said! Which brings me to what most people fear about canning; contamination. Pickles are pretty fool-proof with their super high levels of vinegar and salt, but ever so occasionally, things can go wrong. I’ve never had a problem with pickles, but I am not fool enough to think I’m impervious. Thankfully, it’s pretty obvious when home-canned goods go bad. If you see any of the following signs, or you even suspect a problem, throw it out. Don’t be a martyr! The lid has popped up and/or makes a clicky sound when pressed down in the center. The lid is off the jar entirely. When removed, the lid offers no resistance and/or makes no sound. There is hairy growth on top of the food in the jar. The contents of the jar smell off or foul. Garlic dill pickles are sour, salty, and flush with the classic dill pickle assemblage of spices. This recipe is per quart, so scale up if you have a large clan (or an out-of-control pickle habit). 3-4 heads fresh dill or 1 Tablespoon dried whole dill seed- not weed. 1 cup cider or white wine vinegar Cider gives you a more classic pickle flavor, white wine gives you a more delicate pickle. 1 Tablespoon pickling salt That's basically any non-iodized salt. Kosher salt works well here. Clean and sterilize your jars, lids and rings and a ladle or heat-proof measuring cup with a handle, and a chopstick or butterknife. You can do this one of two ways. Either wash in your dishwasher and use the heat dry cycle or immerse jars and rings, ladle and butterknife in boiling water for five minutes and hold in the hot water while preparing the cucumbers. To sterilize the lids with boiling water, place them in a bowl and pour the boiling water over them. I opt for the dishwasher. Getting a dishwasher changed my canning life! To make the pickles, scrub the cucumbers and take a small slice off the blossom end of the cucumber. Taking off about 1/16" from the end of the cucumber is a little more crunchy pickle insurance. If left intact, the blossom end can release a compound that causes soft pickles. If needed, trim cucumbers down to a size that will fit in your jars. Eyeball your cucumbers and make a rough estimate of how many jars you'll be filling. Line your jars up on the counter and into each of them put the spices and garlic listed above in the quantities given. Pack the cucumbers in on top of the spices and garlic. Don't squish the cucumbers when packing them in, but you don't have to be shy about trying to make the most of the space available in the jar, either. Leave 1/2" of space between the top cucumber and the rim of the jar. This is called headspace and it is important in creating the seal that stands between your delicious food and nasty bacteria and mold. Scale the brine recipe to the appropriate level (Are you making 4 quarts? Use 4 cups cider vinegar, 8 cups water, 4 Tablespoons pickling salt, etc...) Add all brine ingredients to a large stockpot and bring to a boil. While still boiling, pour (I use a ladle for the job) into cucumber filled jars. Again, respect the 1/2" headspace. You may find that you need to pour a little more brine in after it settles into the spaces. This is fine. When you've brined all your jars, gently insert your sterile chopstick or butterknife down the sides of the jar to release air bubbles. If you need to add more brine at this point to reach the 1/2" mark, do so. *If you have leftover brine, don't sweat it. You can save it in the fridge for your next batch of pickles or use it to cook beet greens, or any number of other things. It's better to make more than you think you need so that you don't have to scramble to prepare more brine before processing your pickles! Using a clean paper towel, gently wipe the rims of the jars, place a clean lid on the jar and thread a ring onto the jar to keep the lid in place. Don't crank on the ring with brute force. It's not the ring that is protecting your food. The ring merely holds the lid in place until a good seal forms. Just turn it until it provides resistance. This will hold the lid on tight enough to prevent water from entering the jar, but loose enough that air can be forced out of it during processing. Put the lid on your pot and bring water back to a rolling boil. Once it reaches a rolling boil, start timing! For quart jars you process them for 20 minutes. For pints, process for 15 minutes. Do not underprocess these jars. The processing time is your safety mechanism. It kills nasties that might be on or in the jars and it kick-starts the melding of the flavors. Contrary to what seems might happen, underprocessing can result in mushy, soft pickles. Ewwwww. When processing time is up, carefully remove jars to a sturdy cooling rack over a dish towel. As the jars cool, you'll occasionally hear a "pop" sound. Don't freak out. This is a good thing. This is the sound of the jars sealing. Allow the jars to cool overnight. In the morning, use a damp paper towel to wipe down the jars and check the seals. If you press gently in the center of the lid it should not give at all and should not pop back up. If you have some seals that failed, don't worry. Just store those in your fridge! They're still good to eat, they're just not shelf-stable. Label your jars with their contents and the date they were made. They will be ready to eat in 6 weeks. Robert-Gilles from Shizuoka in Japan! The Japanese do make a lot of them and I eat quite a lot with the Missus’ food. The style and method are completely different, though. Now, as we have them here, the garlic and dill pickles definitely interest me! The fact I’m French means I’m biased in favour of garlic anyway. The Missus is going to complain about the smell! LOL. Cheers and my regards to all! Robert-Gilles, you know the solution to others complaining about the smell of garlic, right? Get them to eat it , too! If you try these, let me know how it goes for you! True, canning is somewhat intimidating to me… i used to remember my mother pickling green papaya with carrots, red bell pepper, onions.. yummy! my hubby likes picked cucumbers… i should try this.. we’ll see. Thanks for such an informative post. I’ve been wanting to try canning for a long time but it seems so intimidating to me. I think I’ll start with these pickles. Thanks again! Now this is something I actually considered doing. I though it would be kind of fun. 🙂 Really great and informative post on it. Side note: thanks for the method for the beans in the crock pot. I will be using that when I make my chicken tacos, Spanish rice and fresh pinto beans this week. Thank you! Melissa- It IS fun. It’s manic fun when you start canning on a huge level, but it’s fun! And have fun with the beans. When I discovered how easy they were to cook a la crockpot I never did the soak, rinse, boil thing again! Thanks. I’m pickling at the moment, but haven’t really had the confidence to move away from fresh, short-term, pickles. But this is exactly the sort of sound sensible advice I need to build that confidence! Thanks, for such great and detailed information. I searched all day and found this just before I was to begin my process. I finished with 7 quarts of pickles and leftover brine which I refridgerated and will use in the next couple of days as I have a whole new batch of cucumbers to pick! Great info and definately bookmarking this website. Tom- I hope you do try them. They’re so much fun to have in the basement/closet in the middle of winter. Kate- Yippee! Come back in 2 months when they’re ready to eat (well, before then, too…) to tell me how you like them. it was superclever of you to tell us to NOT PUT WEED in our pickles. you is teh smartz. Maybe I missed it in the instructions, but when processing your jars, they should not be on the bottom of the pot or you may run the risk of cracking the jars. My canner has a grate-baskety type insertion that keeps the jars from contacting the bottom of the pot directly. You didn’t miss it because there aren’t processing instructions in there! 🙂 This is a fresh pickle/fermented pickle recipe and is intended to be stored in the refrigerator and not on the shelf. Your advice is good, though! p.s. – it was the Candied Jalapeno recipe that brought me here! Yes this is the recipe that uses canning/processing and I thought the same thing too when I read that you don’t need a rack. You don’t, but you do need something between the pot and the bottom of the jars. In a pinch a friend of mine threw some of her silverware knives in and she said it worked just fine. 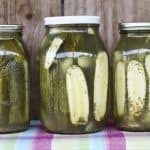 This is the first canned pickle recipe I’ve found that looks like it might really make great pickles, can’t wait to try it. Also, I’ve read that grape leaves can help with crunch, but not sure if that works in canned pickles or not. If anyone knows I’d love to hear it and…do you just use the grape leaves in a jar? I use grape leaves in my pickles, works great! I put one palm sized leaf per pint. two per quart, really helps maintain the crunch. Be sure to wash them well and shake off excess water. Using these two techniques my pickles are still crunchy up to a year later, if they last that long! You mentioned that intact jar and lids are necessary. is it possible that I use ones that were used before if I sterilize them with boiling water? I know some folks do that, Fernanda, but I follow the safety recommendations and use new lids each time. The rings I reuse, but I don’t take a chance on the lids. I’d hate to put the work, time and resources into it and then lose it because of an old lid! Thanks for this lovely recipe! I just made my very first pints of pickles! Can the leftover brine be used to can dill green beans? I do it that way! I have to add the usual warning that it isn’t from an approved recipe, but I’ve done it that way for years. We made this last year for the first time! It goes so fast my whole family lives it! Going for a whole bushel next year! Long live the yummy-ness! Just wondering if one could use this recipie with no salt and possibly more vinegar then water? I honestly couldn’t tell you. This is a question for your local cooperative extension? Hi – I know this is an old post, but was hoping I might still be able to get an answer or two…I would like to use pickle crisp when I make my pickles, do you know if I am supposed use that in addition to the pickling salt or in place of it? Also, would it help the pickes maintain firmness if I let the brine cool down before adding it to the jars, or does it not make a difference? Thanks so much, I love all of your pickle and pickling posts! When you say cider vinegar…is that the same as apple cider vinegar? As in Bragg’s Apple Cider Vinegar? Sorry if this is obvious. That’s not silly at all, Tessa. It can be called cider vinegar or apple cider vinegar. The principle difference between Bragg’s and -say- Heinz is that Bragg’s is raw (has the mother still in it) and Heinz is pasteurized. Either will do, but I personally prefer the flavour of Bragg’s. I’ve found if you use the jar and measure what will fit best in the jar is the secret. I make it in individually measured batches. When I remove the jars each jar will be perfectly measured. I then continue on with the recipe. I just made 7 quart jars of your pickle recipe… then I was reading another website, several of them in fact, that blatantly state that when pickling anything, to never use a ratio of vinegar to water that is less than 1:1. In your recipe, it is less… being that there is more water than vinegar (2 cups water to every 1 cup of vinegar). The other recipe I thought about using had all vinegar, but listed ingredients for pint jars which is why I used yours, because I wanted to do quarts. I know you say you’ve been using this recipe for a while and I’m sure you’ve had positive results, but have you ever heard about this rule of having at least 50% vinegar? I am new to canning and trying to be very cautious, and I’m worried that maybe I wasted my time making pickles that aren’t going to be acidic enough and therefore not safe. I am confident in this ratio as it is almost identical to the one used in the Ball Complete Book of Home Preserving which is considered the gold standard for safety in canning. I’ve noticed that several other sites say the vinegar to water ratio has to be 50/50 to be shelf safe. I’m new at this, so I’m just inquiring. Thanks. These sound awesome! Have you ever done them with a pressure cooker? If so, how many pounds of pressure and how long did you process? Hi there! I have never pressure cooked pickles. I kind of suspect it would make them mushy, but can’t say for certain. Please let me know if you try them that way! Great recipe! I am still quite an amateur canner, as I’ve only been doing it for a few years, so I am definitely still learning what types of ratios, methods, ingredients work best, and to my liking. I will say that this recipe turned out wonderfully. The vinegar to water ratio yielded a perfect flavor, and with the addition of pickle crisp (which I usually use to avoid softening), there was just enough crunch for being processed pickles. I bumped up the recipe to yield three jars, but due to the size of the pickling cukes I got, I ended up making six quart-size jars! I definitely like how you added that one should always eye-up how many jars one thinks they’ll need, because it’s never perfect and always depends on the size of the cukes. Thanks for sharing the great recipe, I will definitely be using it again!